Mars is a dry, frigid, dusty, nearly airless place. A couple of billion years ago, though, it wasn't much different from Earth. A string of space probes have proven that the Red Planet once sported rivers that carved huge canyons across the landscape  and even oceans, whose shorelines are still visible from orbit. Open water couldn't have existed without a relatively thick atmosphere, and most of that Martian atmosphere leaked out into space long ago. But some of that ancient atmosphere, it turns out, headed in the other direction. A series of measurements with ground-penetrating radar mounted on the Mars Reconnaissance Orbiter have revealed a massive deposit of frozen carbon dioxide (CO2)  a Lake Superior's worth of dry ice  buried under a layer of ordinary ice near the Martian south pole. "We knew there was some CO2 at the pole," says Roger Phillips of the Southwest Research Institute in Boulder, Colo., lead author of a report on the discovery in the current issue of Science, "but there's about 30 times more than we thought." It doesn't stay buried, though. 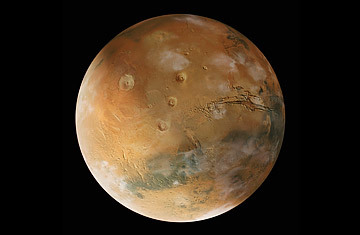 The reason, as the report explains, is that Mars wobbles slightly, so that every hundred thousand years or so, the poles tilt more toward the sun in summer, getting more direct sunlight than they ordinarily would. The extra heating turns the frozen CO2 back into a gas  enough to double the density of Mars' sparse atmosphere. And then, as the planet straightens up, the CO2 freezes out again and the atmosphere thins. The extra CO2 in Mars' atmosphere wouldn't be enough to do much warming, says Phillips, but it's not without effect. For one thing, the thicker air would be enough to allow water to exist on the surface at lower elevations. The oceans of Mars won't return, and probably not the rivers  but creeks and ponds would be possible. A thicker atmosphere would also make Martian winds a lot more powerful. They can already blow at hundreds of miles per hour, but the air is so thin that they don't pack a lot of force. Even so, they're strong enough to create massive dust storms that can shroud huge swaths of the planet. But, says Phillips, "If you double the density of the atmosphere, you double the wind shear." That means the dust storms would be even more dramatic. "The climate on Mars today is pretty harsh," he says, "but if you don't like it now, you really wouldn't like it under those conditions." Since the CO2 cycles in and out of the atmosphere on a 100,000-year timescale and space probes have only been visiting Mars for a couple of decades, this is all theoretical in one sense. But it's hard to imagine how it could be wrong. The changes in Mars' orientation are inevitable, given the laws of celestial mechanics, and it's easy to calculate how much extra heat the poles would get at times of maximum tilt. Plug it all into a computer model of the climate, and the result is pretty straightforward. Not only that: scientists can actually see places in the ice cap that seem to be slumping  a sign that material has recently escaped into the atmosphere. And there's evidence from a number of Mars probes that the planet's atmospheric pressure has increased, even over the short time that we've been visiting. It's barely at the detectable level, says Phillips, "but it could be that we're seeing this effect." All signs, in other words, point to the fact that Mars' atmosphere could be bulking up even now. Within a few tens of thousands of years, space colonists could be drawing water from Martian ponds  even as they're choking on Martian dust. See what the Mars Phoenix Lander saw. Read "The Mars Rovers' Long and Fruitful Journeys."